While inflammation is a natural protective mechanism and repair of the body to overcome tissue injury, allergy or ongoing stress, in chronic conditions the body keeps trying unsuccessfully to turn off the inflammation. Chronic inflammation is nowadays linked to many diseases and is known for worsening their symptoms. One explanation is that inflammation causes the process and accelerated aging, as well as increases the risk of coronary diseases, strokes and cancer. The inflammation causes accelerated erosion and rifts within the body by increasing oxidative activity. Sometimes it is not easy to find all the causes of inflammation, but it’s easier to use available foods in every home to reduce inflammation without the heavy price the body pays for prolonged use of drugs. You can do this by making this tea or the smoothie below to add anti-inflammatory foods to your menu. 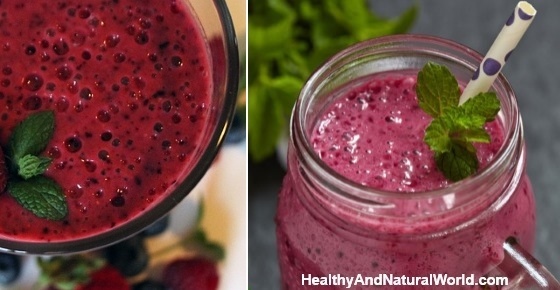 Berries contain polyphenol compounds claimed to have anti-inflammatory activity in humans. Among the most notable polyphenols in berries are anthocyanin’s, that are responsible for their distinctive colors of red, blue, and purple. Berries have been studied widely for their antioxidant properties, and preclinical data suggest important effects on inflammatory processes in the body. Further reading: You can find more useful information about berries in my e-book The Healing Berry Guide which will teach you how to transform your health with berries. Low magnesium level has been associated with numerous pathological conditions characterized as having a chronic inflammatory stress component. One of the best food sources for magnesium are dark leafy greens (like kale and spinach). Kale, spinach and other leafy greens also have high concentrations of vitamins that fight disease. Specifically vitamin E that has anti-inflammatory properties. The other antioxidants that are found in dark leafy greens are important components of an inflammation-fighting diet. Further reading: read my previous article on how to detox your body with these 8 leafy greens. If you suffer from arthritis pain in the knees, consuming ginger on a daily basis can definitely help. Ginger contains powerful anti-inflammatory substances called gingerols. These have been tested in various research of rheumatic diseases such as osteoarthritis or rheumatoid arthritis. The participants in the studies reported a gradual reduction of pain, improving agility and movement and reduction in swelling when using ginger regularly. Further reading: find here how to use ginger as a medicine for great health. Adding ginger to your diet is also one of the 70 habits featured in my e-book 70 Powerful Habits For A Great Health which will guide you how to take positive steps to improve your wellness and overall health. The lauric acid in coconut oil has anti-inflammatory properties, a study in the February 2010 issue of “Pharmaceutical Biology” found virgin coconut oil — which is processed at low heat without chemicals — reduced ear and paw swelling in rats, while also inhibiting chronic inflammation. In another research, researchers extracted the antioxidants unique to virgin coconut oil from the oil and injected them into rats with induced arthritis. They found that the unique coconut oil antioxidants reduced inflammation associated with arthritis more effectively than current pharmaceutical drugs. Further reading: read the article about the many proven health benefits of coconut oil. These very nutritious seeds are high in omega-3 fatty acids, which are responsible for metabolic processes that help fight inflammation. According to the University of Maryland Medical Center, Research shows that omega-3 fatty acids reduce inflammation and may help lower risk of chronic diseases such as heart disease, cancer, and arthritis. If you cannot find chia seeds, use ground flaxseed or walnuts instead. Further reading: 10 amazing reasons you should eat chia seeds. Chia seed is one of the superfoods mentioned in the e-book about superfoods which is part of the Natural Health Revolution Program. This program will help you to achieve your health, nutrition and weight loss goals. The main polyphenol in green tea is called epigallocatechin gallate (EGCG). Scientific studies suggest that EGCG and green tea polyphenols have anti-inflammatory and anticancer properties. Further reading: read about 8 amazing health benefits of green tea and why you should drink more of it. The herbal infusions below help to cleanse your body and stimulate its organs to detox and get rid of various toxins, such as pollutants, fat that builds up in the tissues, excess minerals and heavy metals. The liver contributes to toxic and metabolic waste removal, the colon is part of the digestive system which removes toxins threw bowl movements and the kidneys regularly pump urine out of the body and get rid of metabolic waste. You can find helpful information in my e-book The Detox Guide that teaches you about the concept of detox and how to use detox to energize and cleanse your body. This guide provides the best information and safe ways to detox, including recipe ideas. The whole process helps to increase stamina and energy and improves the digestive process. This infusion contains herbs that are mildly laxative and bitter in order to stimulate the digestive system and to encourage bowel movements. Chop the fresh herbs. Add the yellow dock root, licorice root and ginger. Pour the boiling water over them, cover the pot and steep for 15-20 minutes. The infusion will be bitter, so add honey to taste, and drink 3-5 hot cups per day for maximum 3 days. Also read my article the best foods to cleanse your colon. This infusion cleanse the kidneys, nourishes the urinary tract and keep fluids flowing to keep urinary tract infection at bay. Don’t use this infusion if you are pregnant or breast-feeding. Combine the herbs in 1 liter glass jar. Pour boiling water over them to fill the jar. Steep for 5-8 minuted. The infusion will be bitter, so add honey to taste. Drink 2-3 hot cups per day. You may also be interested to read my article the best foods and herbs to cleanse your kidneys. Lung cleansing tea is well known for relieving respiratory congestion, colds and bronchitis. It soothes irritated bronchial passages and removes excess lung mucus. In 3 cups of water simmer licorice for about 10 minutes. For the next 10 minutes simmer again after adding peppermint and mullein. Strain. Read also my article about the best foods to cleanse your lungs. The seeds of milk thistle are known as a powerful cleanser of the liver. They contain phytochemicals that stimulate the secretion of bile from the liver and gall bladder. Crush the milk thistle seeds into a fine powder using mortar and pestle. Pour boiling water over the crushed seeds and steep for 20 minutes. Pour the mixture through a strainer and discard the seeds. Drink 1 cup three times a day: twice before meal and once before bed. You may also be interested to read my article about the best foods to cleanse your liver. The lymphatic system is a drainage network of fluid, organs and vessels that is responsible for the removal of cellular waste and foreign agents such as bacteria, viruses, toxins etc. The lymph is the fluid that circulates throughout the lymphatic system. The lymph moves through the lymph nodes, where they are destroyed. I’ve shared with you in the past natural ways to cleanse your lymphatic system, and one of them was using herbs. The herbs in this lymph cleansing infusion are famous for their excellent effect on the lymphatic system, and if you consume this lymph cleansing infusion regularly, it will help to ensure proper lymphatic drainage. Calendula – the most common uses of calendula flowers are for wound healing, reducing skin inflammation, clearing the lymphatic glands and as a general immune tonic. Cleavers – this herb stimulates the activity of the lymphatic system and organs so they can perform at their best. It helps in cases of lymphatic congestion and swollen lymph glands, and it also helps to cleanse and nourish the blood. Mullein – this herb treats lymph congestion. The leaves and flowers activate lymph circulation and can be useful for swollen glands, especially when lymph nodes in the throat, neck, arms, and groin swell or are congested. Place the herbs in a small saucepan and cover with cold water. Heat slowly and simmer, covered for 20-45 minutes. The longer you simmer the herbs, the stronger the tea will be. Drink 2-3 cups a day for 2 to 3 weeks. remember to soak your chia seeds first! When to take this and for how long? anytime ,before or after meals , empty stomach etc? There are no “official” recommendations like in conventional medicines. All the ingredients are safe to consume for long period of time so it’s really up to you. It can be consumed on a daily basis before or after a meal. There are no strict rules. We have a smoothie every day for breakfast, and always switch out the fruit and veggies, but always have greens, ginger, (home made) yogurt, lemon wedge and avocado wedge or coconut oil as a basis. You need the oils to help nutrient absorption. Haven’t been sick in the 2 years we have been drinking this breakfast. It’s good & so nice all about the information .Thank you so much. If you don’t have fresh ginger but have ground ginger, how much would you use? Hi Susan, generally speaking because ground spice is more concentrated than fresh one, usually the ratio is 1/3, for example: 1 tsp. of fresh herb is replaced by 1/3 tsp. of ground spice. However I’ve seen several references that recommends even less in case of ginger since it’s very concentrated in ground form – 1/4 teaspoon of ground ginger for each tablespoon of fresh grated ginger. I would say that in this case you can use something like 1/4 -1/3 tsp. of ground ginger.